Luke Browder is a performer of opera, operetta, and musical theatre residing in the Upstate of South Carolina. Mr. Browder has served on the music faculty of both North Greenville University and Clemson University. Recent work has included performing the roles of Father in Ragtime with Greenville Little Theatre, Alan in Boys in the Band with Proud Mary Theatre Company, and The Baker in Into the Woods with Centre Stage. During the 2015-2016 season Mr. Browder provided direction of Disney's Mary Poppins for Greer Children's Theatre, performed as Lou Levy, Bing Crosby, and ensemble in Sisters of Swing at Centre Stage, and a run as Old Man Strong and Billy Boy Bill in Urinetown at The Warehouse Theatre. Mr. Browder also provided music direction and performed as a caroler for Greenville Tehnical College's performance of A Christmas Carol. In the 2014-2015 season, Mr. Browder performed as Schaunard in La Bohème with Glow Lyric Theatre; a Jordanaire in Always Patsy Cline with Mill Town Players; Lt. Joe Cable in South Pacific at Fire Theatre Company; Prince Hector in the World Premiere of S. David Berry's opera Troiades with Converse Opera Theatre; King Arthur in Monty Python's Spamalot at Centre Stage; and The Wolf/Cinderella's Prince in Into the Woods, also at Fire Theatre Company. 2013-2014 season performances included a collaborative faculty recital with Lisa Sain Odom, soprano, and Fabio Parrini, piano, Mozart's Mass in C Minor at Clemson University, Mozart's Missa Brevis in D Major at Limestone College, and an appearance with the Greenville Chorale at the Peace Center in their Fall 2013 concert, From Broadway With Love. Mr. Browder also made his directorial debut with the Greer Children's Theatre production of Tarzan the Musical. 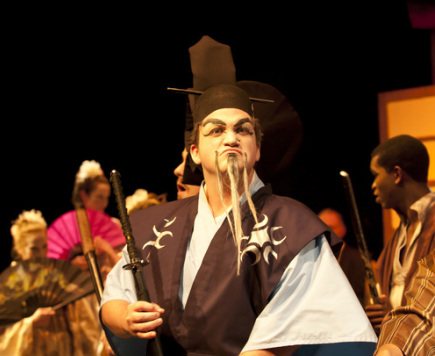 Previous stage roles have included: Carousel (Jigger Craigin) with Asheville Lyric Opera, A Little Night Music (Mr. Lindquist) with The Warehouse Theatre, Hansel and Gretel (Father) and Così fan tutte (Guglielmo) with Converse Opera Theatre, The Mikado (Pooh-Bah) and Trial by Jury (The Usher) with Glow Lyric Theatre, Die Fledermaus (Frank) and The Gondoliers (Giuseppe Palmieri) with The Spartanburg Repertory Company, and La Traviata (Barone Douphol) with Greenville Opera. A versatile musician, Mr. Browder has also performed as a chorus member and soloist with the Greenville Chorale and its professional Chamber Ensemble, the Piedmont Men's Chorale, and with the Spartanburg Festival Chorus and Spartanburg Philharmonic Orchestra. In addition to live performances, he has been featured on two demo recordings: the musicals Practical Anatomy by Chicago actress, playwright, and composer E.A. Bagby, and Romance! by Greenville composer James Stiepan. Mr. Browder is an Instructor of Music at North Greenville University, where he teaches voice and related music courses. He has previously served as Director of Music at Aldersgate United Methodist Church, Adjunct Instructor of Voice at Clemson University, Voice Instructor at the Lawson Academy of the Arts at Converse College, and Director of Music at Eastminster Presbyterian Church. He holds a Bachelor of Music degree from Furman University in Greenville and a Master of Music degree from Converse College in Spartanburg. Mr. Browder is a member of the National Association of Teachers of Singing and is an Equity Membership Candidate with Actors' Equity Association.